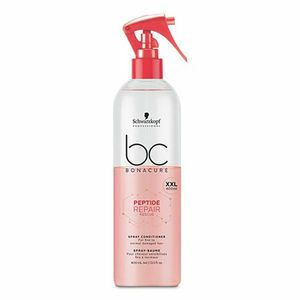 Schwarzkopf BC Bonacure Peptide Repair Rescue Spray Conditioner treats your clients' dry and damaged hair to a shot of instant vitality! It's a leave-in product that provides instant repairing action for hair that truly needs some TLC. If hair has been damaged and stressed by chemical treatments and processing, this is a great product to reach for. The formula works to improve hair strength and elasticity while softening and sealing the hair's surface. This ultimate spray conditioner also improves manageability thanks to its terrific detangling properties. Available in 400-ml spray bottle. £14.94 (inc. VAT) Why no VAT? We're a trade wholesaler and quote our prices without VAT to help our VAT-registered customers understand the true cost of a purchase. Gentle, cleansing shampoo for fine to normal, damaged hair with peptides that repair hair's inner architecture and guarantee a long-lasting conditioning effect. Available in a 1000-ml bottle. Reduced to clear! Last few remaining of 250-ml and 1000-ml bottles in old packaging! Save 25%!